Two people were killed Tuesday morning when the car they were in was struck by a Long Island Rail Road equipment train at a railroad crossing in Brentwood, officials said. According to the MTA, the crash happened just after 10 a.m. at the Suffolk Avenue crossing. The car with two passengers inside was hit by the train at the crossing, was pushed several feet and ended up wedged under the train. MTA police said the train's engineer and witnesses saw the car trying to go around the railroad's gate before the crash. "As he approached the crossing the motorman witnessed the vehicle go around the lowered gate," said MTA Police Captain Neil Boyle. "He put the train into emergency brake, sounded his horn -- that's when it struck the vehicle." MTA investigators are looking into witness reports that the car's driver was talking on a cell phone at the time of the crash. 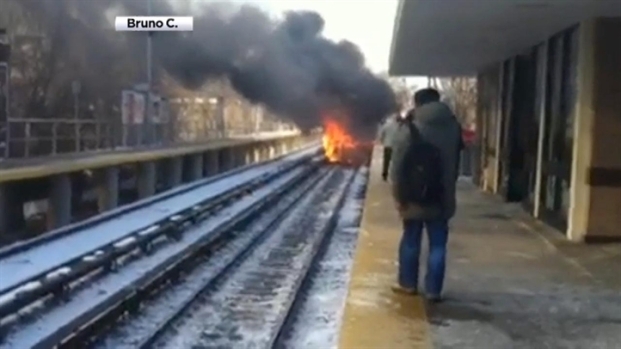 Horrified riders on the station's platform watched as the car caught fire after it was hit. "It was up in flames, gray smoke. A big mess," said rider Joan Innocent. "It was heartbreaking." There were no passengers on the equipment train when it struck the car. The three-man crew on board the train escaped without injury, authorities said. Eastbound service on the Ronkonkoma line has been restored. Westbound commuters can take a shuttle from Brentwood to Farmingdale.